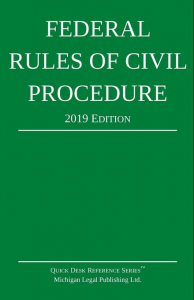 Rule 7.1 is drawn from Rule 26.1 of the Federal Rules of Appellate Procedure, with changes to adapt to the circumstances of district courts that dictate different provisions for the time of filing, number of copies, and the like. The information required by Rule 7.1(a) reflects the “financial interest” standard of Canon 3C(1)(c) of the Code of Conduct for United States Judges. This information will support properly informed disqualification decisions in situations that call for automatic disqualification under Canon 3C(1)(c). It does not cover all of the circumstances that may call for disqualification under the financial interest standard, and does not deal at all with other circumstances that may call for disqualification. Although the disclosures required by Rule 7.1(a) may seem limited, they are calculated to reach a majority of the circumstances that are likely to call for disqualification on the basis of financial information that a judge may not know or recollect. Framing a rule that calls for more detailed disclosure will be difficult. Unnecessary disclosure requirements place a burden on the parties and on courts. Unnecessary disclosure of volumes of information may create a risk that a judge will overlook the one bit of information that might require disqualification, and also may create a risk that unnecessary disqualifications will be made rather than attempt to unravel a potentially difficult question. It has not been feasible to dictate more detailed disclosure requirements in Rule 7.1(a). Rule 7.1 does not prohibit local rules that require disclosures in addition to those required by Rule 7.1. Developing experience with local disclosure practices and advances in electronic technology may provide a foundation for adopting more detailed disclosure requirements by future amendments of Rule 7.1. Changes Made After Publication and Comments. The provisions that would require disclosure of additional information that may be required by the Judicial Conference have been deleted. The language of Rule 7.1 has been amended as part of the general restyling of the Civil Rules to make them more easily understood and to make style and terminology consistent throughout the rules. These changes are intended to be stylistic only.